The unemployment rate in the 15–64 age group stood at 4.0% in October, a 0.8ppt drop YoY and a 0.1ppt decrease compared to the previous month. The number of unemployed fell to just over 183-thousand. The number of employed is just below 4.4 million, remaining close to an historically high level, despite the 4.9k drop on a monthly basis. However, employment is up by roughly 41k (0.9%) year-on-year among 15–64-year-olds. The composition of the latter increase is favourable, as the number of employed increased in the primary labour market, by 84.4k YoY. Meanwhile, the number of fostered workers (employed by the government in low-paid, low-skilled jobs) and those working abroad dropped by 33.9k and 9.6k, respectively. The number of fostered workers is now around 187k, but this reading is still higher than the number of people without jobs.The activity rate of the 15-64 age group is at 71.6%, a 0.9ppt increase in YoY terms, hovering around this level in the past 3 months. We expect the positive trend to continue in all of the above-mentioned categories. The activity rate will be boosted by recent government measures in setting up temporary work agencies for pensioners. The number of vacant jobs in the business sector was around 54k (near to record high level) in 3Q17 and we expect increasing demand based on the surveys. 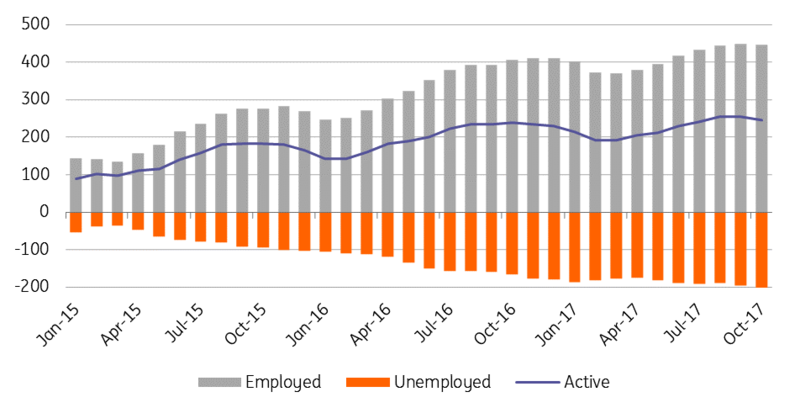 With the unemployment rate converging to the sub-4% territory by year-end, the Hungarian labour market will tighten further in 4Q17.